The 2017 1 oz Gold Griffin is the second in the Queen's Beast coin series from the British Royal Mint. It's one of the most-eagerly anticipated bullion coin releases in the world as well as one of the most beautiful. Designed by Jody Clark who is known for his definitive 'fifth portrait' of Queen Elizabeth II, the Gold Griffin is a truly impressive coin. The Queen's Beast collection of coins will feature 10 separate designs based on the heraldic symbols of the British Monarchy. For the coronation of HM the Queen in 1953, 10 gold plaster statues in the form of these legendary beasts stood guard. The Griffin of Edward III was one and it's this proud, mythic creature that adorns the reverse of this striking bullion coin. The griffin, a creature of legend and a popular Royal heraldic feature, is said to have the body, back legs and tail of a lion and the head, wings and front talons of an eagle. Jody Clark has chosen to show the Griffin of Edward III in its full glory, head slightly raised to the right to capture its curved beak and with swishing lion's tail and fully extended wings. The Gold Griffin 1 oz 2017 coin is an essential buy for serious collectors as well as a smart choice for investors. 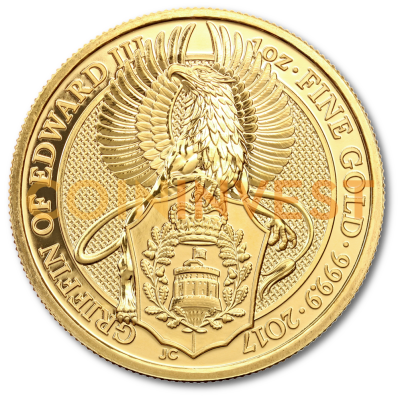 Each Gold Griffin is minted from .9999 fine gold making it one of the purest bullion coins on the market. Add its exclusive design and intricate details and you can see why it is so highly valued among the world's numismatists. As well as a magnificent addition to any collection, the coin's purity and exclusive design mean that it's highly likely to increase its value substantially over the years. coininvest.com is proud to offer its customers the sensational 1 oz Gold Griffin 2017. The Queen's Beasts series has already surpassed the expectations of collectors with its beautiful artwork and exceptional level of detail. Why not add one of our custom display cases to your order to protect your Gold Griffin and show it to its best advantage?